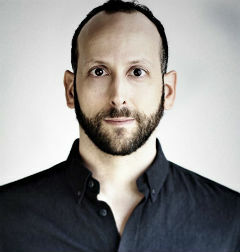 Now based in L.A., Alex Nussbaum has presented himself comedically across the Canadian entertainment landscap‍‍‍e‍‍‍. From his hour-long standup debut on CTV & Comedy Network’s Comedy Now to his follow-up on CBC’s Just for Laughs and Vancouver Comedyfest, through his appearances on Much Music’s popular Video On Trial, Alex is a familiar face, and voice. His debut comedy CD, Absolutely Free! *, continues to run in heavy rotation on SiriusXM throughout the North Americas. He’s also received a Canadian Comedy Award nomination for Best Male Stand-up and was chosen Best Comedy Show of the Year in Toronto’s NOW Magazine. While performing standup, Alex has also provided numerous character voices for animated programs on Teletoon and the Cartoon Network, most notably over two dozen guest voices on Pink Panther and Pals. Not new to animation, back in his day-job days, he worked on the drawing side of things – designing characters, props and locations for many shows, including the beloved info-tainment hit, Magic School Bus. He’s also written for a bunch of animated shows that have appeared on the Cartoon Network and around the globe. Alex also performed his own one man show at the Toronto Fringe Festival, Handbook to the Future: A Brave New Worrier, which won Patrons’ Pick and chosen by Now Magazine as the number one can’t-miss show at the Fringe. His second album, a number of bits, was released at the North By Northeast Music and Arts Festival and can currently be heard on SiriusXM.